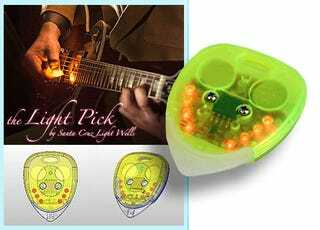 LEDs are so small that now they can even fit into a guitar pick, and Santa Cruz Light Wells (SCLW) has placed a group of eight of them on the Light Pick, which is powered by a tiny watch battery and also functions as a metronome. It's available in a variety of colors, and in right-handed and left-handed versions. It also includes three interchangeable tips for light, medium, or heavy picking action. Only problem is, the Light Pick's $60 price is enough money to buy hundreds of conventional guitar picks. But then if you want it to look like your playing is packing enough heat to set that guitar ablaze, it might just be worth it.